Further enhancing the proven technology used in its Classic, the most popular conservatory roof on the market, Ultraframe has launched a new Classic Aluminium suite which combines state-of-the-art design technology with contemporary profiles, to provide a strong yet lightweight system that can be configured into virtually any roof design, to suit a wide range of consumer tastes. The range features aluminium glazing bar top caps, aluminium ridge body and low profile cresting, as well as aluminium cast ridge end, integral brush and weathering flashing. There is also the option to add a traditional cresting and ball finial too. Mark Hanson, marketing manager at Ultraframe, commented: “Drivers such as a desire for wider colour choices, has resulted in an increase in demand for aluminium conservatory roofs. As a consequence of this, we have launched a new high performance suite of aluminium claddings which is set to further boost existing customers’ sales mix and pull in new users. “It is an extremely durable design and comes with a coating ‘lifetime’ guarantee of up to forty years, depending upon environment. When selling the Ultraframe Classic aluminium roof, retailers have the choice between two different shaped transom top caps; a contemporary and a traditional option. All Ultraframe top caps in the range utilise innovative Schlegel Q-lon gaskets which are inserted into the glazing bar top cap slots. Due to their unique design shape, when under compression, these gaskets create a double weatherseal, remaining operational and elastic even in the worst of weather conditions, without any loss in seal. It is also the only aluminium suite on the market to offer a Cornice option – a decorative fascia designed to hide the uPVC gutter and give the conservatory an enhanced appearance. The Ultraframe Classic aluminium roof also takes a different approach to top cap retention. 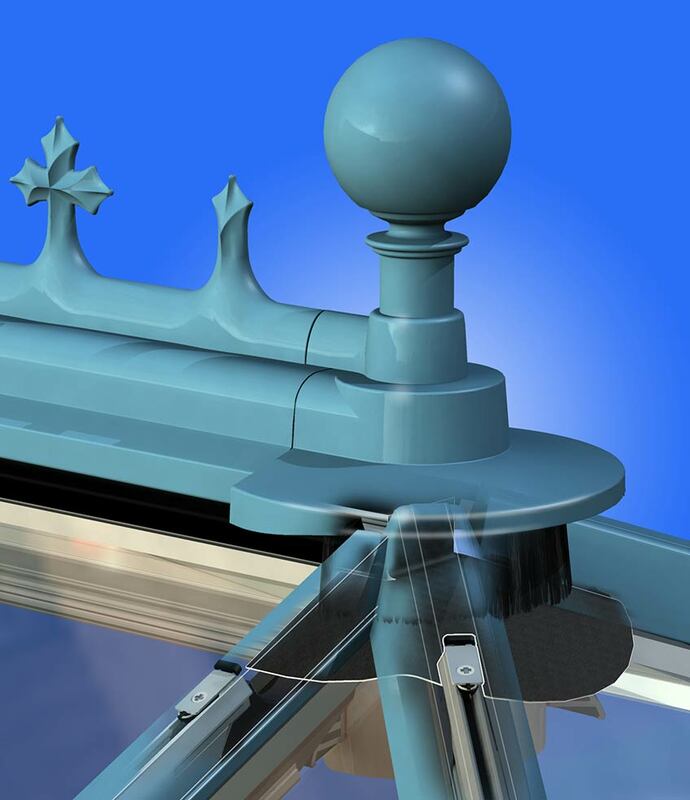 To ensure that there is a constant thermal break and that no fixings puncture the primary weatherproofing, Ultraframe has developed a new patented device which is simply ‘zipped’ into the head of the aluminium bar whilst the roof is being built. These spring clip security devices are then deployed at 500mm centres on site, nipped into final position before – with no more than the heel of the hand – the top cap is finally secured. To ensure that retailers have all the tools and knowledge required in order to sell this innovative roofing option, the Classic aluminium range comes with a comprehensive installation guide which includes details on how to install the roof as well as detailed information on retouching, maintenance and cleaning of the aluminium painted finish which fitters can pass on to the homeowner to ensure that proper care is taken during the lifespan of the product.